Update: We've now seen the Samsung Galaxy Watch, and you can read all about it here. It looks like we were right and we're excited to get our first look at the watch very soon. Want to see the Samsung Galaxy Watch out in the wild a few moments before it's announced on stage? TechRadar just spotted it on someone's wrist at the official Galaxy Note 9 launch event in New York. While waiting to enter the venue to hear all about the Galaxy Note 9 - and now we think the Galaxy Watch too - we spotted the device you can see below on someone's wrist. 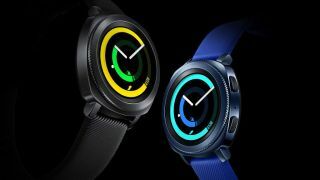 It doesn't look like any previous Samsung smartwatch devices, and we're quite certain it's the Galaxy Watch as it looks remarkably similar to a leaked listing that appeared on Samsung's own website last month. That leak provided the rose gold shade, but this time it looks like it's the gold color. A gold version has previously been rumored and is a new addition that we haven't seen on any other Samsung watches. It looks to have the same thick bezel around the display as on the leaked listing, but we don't know much else about the watch from this image. The person wearing the watch was standing next to a Samsung employee, so it may be this is someone who will be toting the watch on stage at the launch event. Although this doesn't give us the clearest look yet at the next watch from Samsung, it does give us more hope we're about to hear all about it on stage at the Galaxy Note 9 launch.